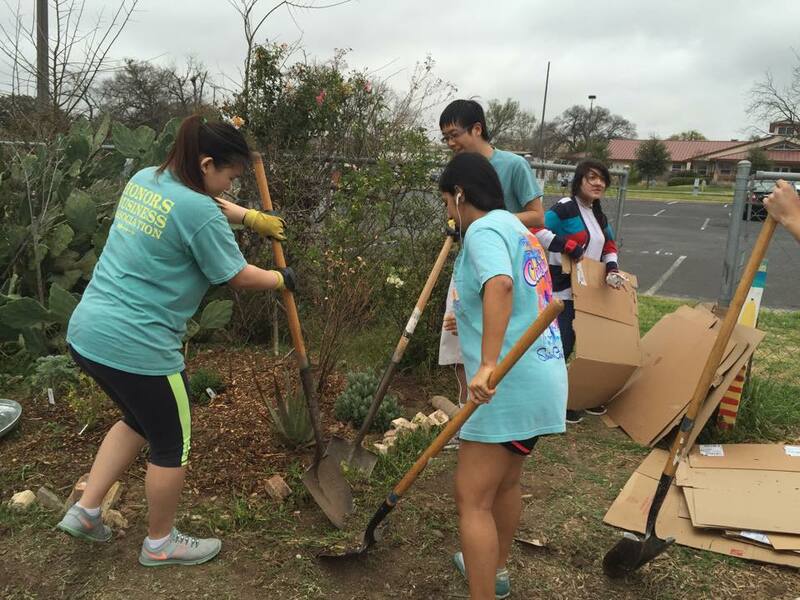 I and several other HBA members enjoyed volunteering with HBAlumni at Concho Community Garden this past Saturday. It was a beautiful day to volunteer. We worked together to remove grass roots from the soil, then cover the soil with cardboard and mulch. We also got to plant carrot, spinach, and beet seeds! Afterwards, we enjoyed funky sandwiches at the Austin Press (highly recommend!). As we worked, the students in charge of the garden informed us of its background. The Concho Community Garden was one of the projects started with the “green fee”, which is made up of 5 dollars from each students’ tuition. While it serves as a vital part of the East campus community, the university is contemplating tearing it down to make room for graduate student housing. However, this is still being debated; many students are very passionate about the garden, and are fighting to protect it. If you or anyone you know feels passionately about the environment or just likes to garden, the students at Concho Community Garden are looking for new interns to help care for the garden on a regular basis. If you want more info, visit their website: https://utconchocommunitygarden.wordpress.com/.